We've had some great prices on cherries here lately, and I can't resist them at the grocery store or Farmer's Market. There's a little cafe here in Decatur - Our Way - where my best friend and I used to go almost every day in high school during the period when we were supposed to be working on the yearbook. (Represent.) We were rebels. We'd get the three-veggie plate, sweet tea, and I always got cherry crunch. I've been trying to approximate their recipe for upwards of a decade, and since the restaurant was closed for several years, I've been doing it from my memory of that wonderful dessert. And I think that if I were willing to add two more sticks of butter to this recipe, I'd have it. But let's just leave it at a cup, shall we? Recipe after the jump. 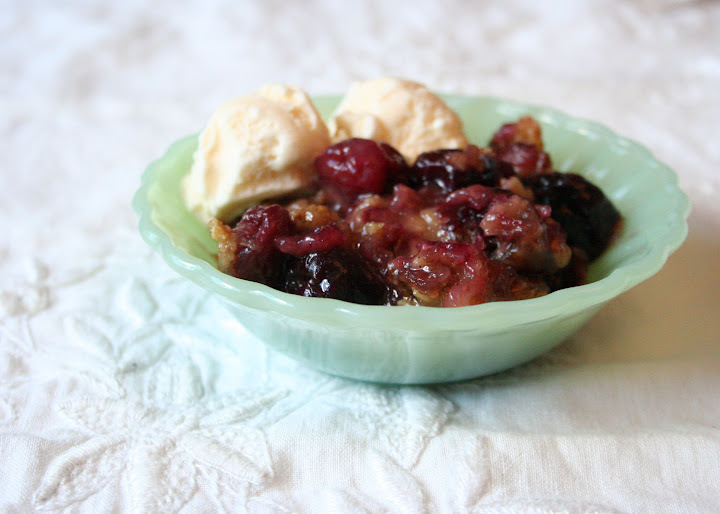 I've gradually cut the sugar in this recipe, but if you like your desserts very sweet, you can use 1 1/2 cup white sugar in the cherries and 1 cup brown sugar in the topping. Preheat oven to 375 degrees Fahrenheit. Grease the sides of a 9" x 13" baking dish. 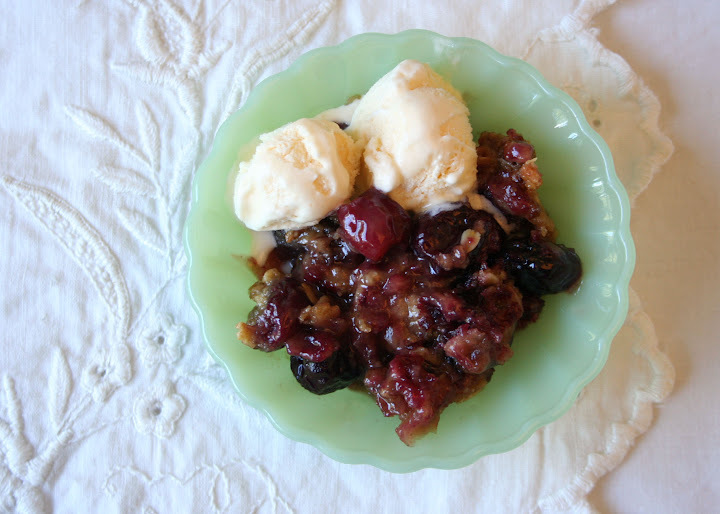 In a large bowl, combine cherries, orange juice, vanilla extract, almond extract, 1 1/3 cup white sugar, and 4 tablespoons flour. Spread into the greased dish. In a medium bowl, combine 1 1/2 cups flour, oats, cinnamon, and brown sugar. Cut in butter until crumbly. Mix in chopped pecans. Sprinkle over cherries. Bake in preheated oven 45 to 50 minutes. Tent with aluminum foil after first 30 minutes. Let cool 30 minutes, and serve with vanilla ice cream. This keeps very well, and makes for delicious leftovers.